This vibrant design is playful and celebratory, reflecting the positivity to have come out of the community project in its work so far. 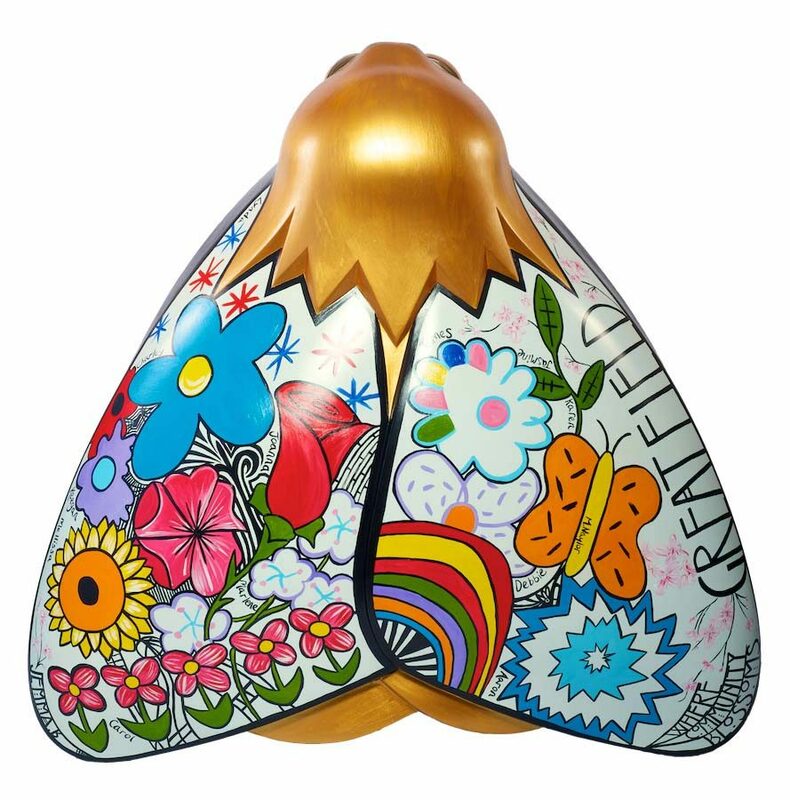 The moth design features images which celebrate renewal and growth including Greatfield Big Local’s special cherry blossom motif. The cherry blossom has become a symbol of hope for the people involved in the project, taken from the trees which bloom in the area each year. The gold tone of the moth’s head acts as a royal backdrop to the brightly decorated floral wings, along which the name of the project’s focus area is adorned. Community members of all ages worked with the artist to explore ideas around growth and blossoming. The group working on the design were selected by Greatfield Big Local to represent a variety of points of view across the estate. People of all ages were invited to take part and contribute their ideas to the design. The collection of colours, themes and patterns were then interpreted by visual artist Jemma Brown. Greatfield Big Local is a resident-led community development project for Greatfield Estate in Hull. The purpose is to create lasting change, with local residents as ‘experts’, making decisions about what is needed to make the area thrive. The project celebrates all that is good about the estate, including Mick Ronson who came from Greatfield and was guitarist with the Spiders from Mars, David Bowie’s backing band. Mick is an inspirational example of achievement being used to celebrate the area. Over the next few years the community will see improvements tailored to meet the unique needs of the area.